This active and always on the move bright orange butterfly is common and is found mainly in urban parks and gardens where its caterpillar host plants - Salix babylonica (Weeping Willow) and Flacourtia inermis (Rukam assam) grows. The butterfly is fast flying and often feeds and moves quickly with half-opened wings. 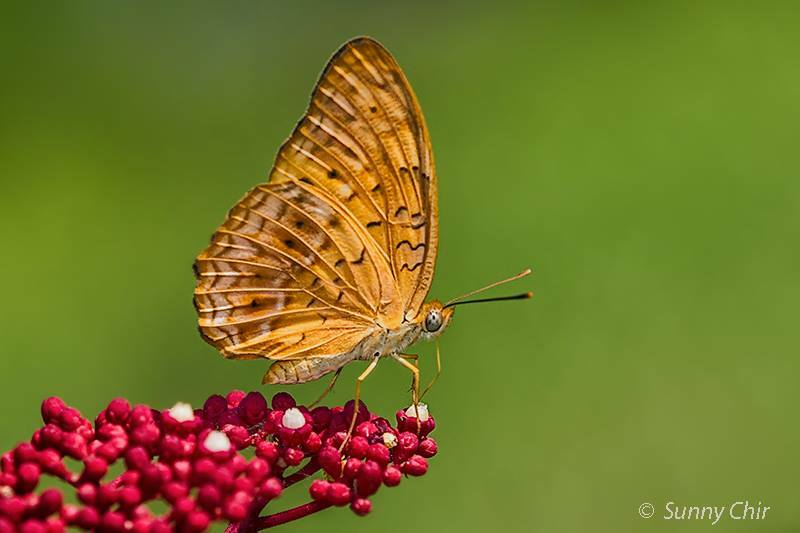 It is believed to be a relative of the temperate-climate Fritillary butterflies. This Leopard was photographed by ButterflyCircle member Sunny Chir. It is shown here displaying the underside of its wings, which appears with a purplish wash when seen in sidelight. It is feeding on the ruby-red flower of the Leea rubra.